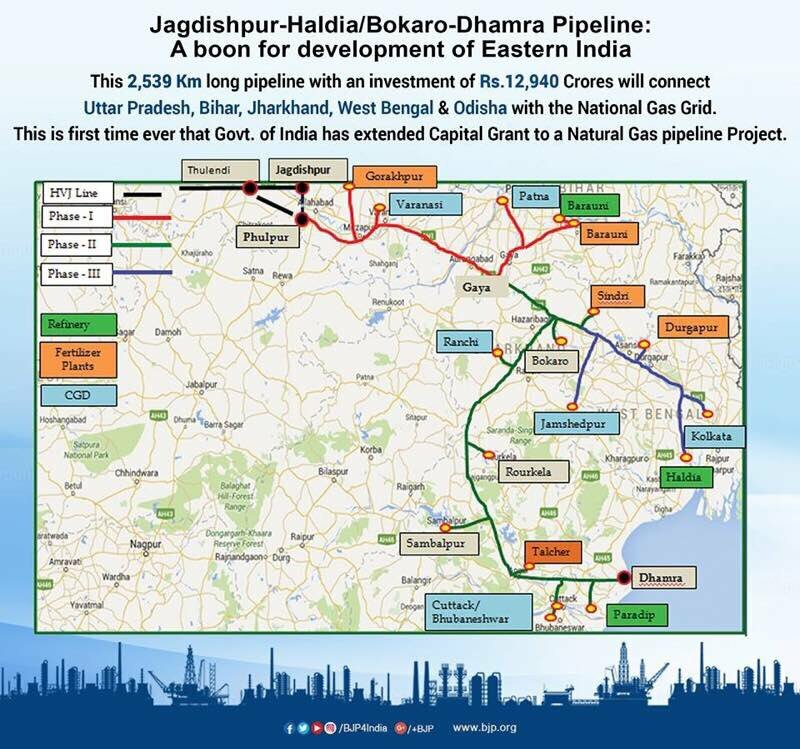 Bhubaneswar, December 24, 2018: Hon’ble Prime Minister Shri Narendra Modi today laid the foundation stone of the Bokaro – Angul section of the Jagdishpur – Haldia & Bokaro – Dhamra pipeline (JHBDPL), paving the way for the supply of natural gas for households, vehicles and industries in 11 districts of Odisha and Jharkhand. The foundation stone was laid by the Hon’ble Prime Minister in the presence of Hon’ble Governor, Odisha, Prof. Ganeshi Lal, Hon’ble Chief Minister, Odisha, Shri Naveen Patnaik, Hon’ble Minister of Tribal Affairs Shri Jual Oram, Hon’ble Minister of Petroleum & Natural Gas and Skill Development & Entrepreneurship Shri Dharmendra Pradhan, Hon’ble Member of Parliament Shri Prasanna Kumar Patasani and a host of other dignitaries. The Bokaro – Angul section being constructed by GAIL (India) Limited will have a total length of 667 km, of which 367 km will be in Odisha and 300 km in Jharkhand. It will cover five districts in Odisha (Angul, Sundargarh, Jharsuguda, Sambalpur and Debagarh) and six districts in Jharkhand (Bokaro, Ramgarh, Ranchi, Khunti, Gumla, Simdega). The project cost of this section will be approx. Rs 3400 crores and is scheduled to be completed by December 2020. The section is part of the 2650 km-long JHBDPL project, popularly known as ‘Pradhan Mantri Urja Ganga’passing through the states of Uttar Pradesh, Bihar, Jharkhand, West Bengal & Odisha. The pipeline is further being extended from Baruani (Bihar) to Guwahati (Assam) with a length of approx. 730 Km which will be a gateway for pipeline infrastructure in the North East. Petroleum and Natural Gas Regulatory Board (PNGRB) has already awarded the Geographical Areas for development of City Gas Distribution networks in these 11 districts to different entities and the Bokaro – Angul section will be cater for the supply of natural gas to these areas. GAIL has already placed order for line pipes for the section and delivery has commenced at the site. Work will be executed in five sections and five contractors have been engaged for the purpose. The pipeline shall benefit a large population in the districts enroute with clean and green fuel in the form of household PNG connection & establishment of CNG station resulting in easy accessibility to cooking fuel to thousands of households and reducing vehicular pollution. Further, it will also cater the energy demands of steel, refractories, aluminum and other industries en-route the pipeline, besides generating employment opportunities for thousands of local youth.